For other uses, see First Blood (disambiguation). First Blood (also known as Rambo and Rambo: First Blood) is a 1982 American action thriller film directed by Ted Kotcheff. It was co-written by and starred Sylvester Stallone as John Rambo, a troubled and misunderstood Vietnam veteran who must rely on his combat and survival senses against the abusive law enforcement of a small town. It is based on David Morrell's 1972 novel of the same name and is the first installment of the Rambo franchise. Brian Dennehy and Richard Crenna also appear in the film as supporting roles. The film was released in the United States on October 22, 1982. Despite initial mixed reviews, the film was a box office success, grossing $125.2 million at the box office. Since its release, First Blood has received reappraisal from critics, with many praising the roles of Stallone, Dennehy, and Crenna, and recognizing it as an influential film in the action genre. The film's success spawned a franchise, consisting of four sequels (all of which were co-written by and starred Stallone), an animated series, comic books, novels, and a Bollywood remake. A fifth film, tentatively titled Rambo: Last Stand, was cancelled in January 2016 when Stallone stated that he was retiring the character. In May 2018, a revised fifth film titled Rambo V: Last Blood was announced, and is scheduled for a fall 2019 release. Seven years after his discharge, Vietnam War veteran John Rambo travels by foot to visit one of his old comrades, but learns upon his arrival that his friend has died from cancer due to Agent Orange exposure during the war. Rambo continues to travel, wandering into the small town of Hope, Washington. He is intercepted by the town's Sheriff, Will Teasle, who considers Rambo an unwanted nuisance. When Rambo asks for directions to a diner, Teasle drives him out of town and tells him not to come back. After Rambo returns, Teasle arrests him on charges of vagrancy, resisting arrest and possessing a concealed knife. Led by chief deputy Art Galt, Teasle's officers abuse Rambo, triggering flashbacks of the torture he endured as a POW in Vietnam. When they try to dry-shave him with a straight razor, Rambo overwhelms the patrolmen, regains his knife, fights his way outside, steals a motorcycle and flees into the woods. Teasle organizes a search party with automatic weapons, dogs and a helicopter to recapture him. During the search, it is revealed that Rambo is a former Green Beret and received the Medal of Honor for his service. Galt spots Rambo and resorts to lethal force in defiance of orders, attempting to shoot Rambo from the helicopter. Trapped on a high cliff over a creek, Rambo leaps into a tree, injuring himself in the process. As Galt leans out of the helicopter to aim, Rambo throws a rock, which fractures the helicopter's windshield; the pilot's sudden reaction causes Galt to lose his balance and fall, taking a deadly plummet onto the rocks below. Rambo tries to persuade Teasle and his men that it was an accident and that he wants no more trouble, but the cops open fire and pursue him into a wooded area. Using his combat skills, Rambo disables the deputies non-lethally one by one until only Teasle is left. Holding a knife to his throat, Rambo tells him he could have killed them all and threatens to fight back much harder if Teasle doesn't let it go. Teasle chooses to press the issue and the state police and national guard are called in to assist in the manhunt. At the same time, Rambo's mentor and former commanding officer, Colonel Sam Trautman arrives. Warning of his former soldier's abilities, which were put to good use in Vietnam, Trautman advises that Rambo be given a gap to slip through so he can be recaptured more safely later. Confident that Rambo is hopelessly outnumbered, Teasle refuses. But since Rambo stole a police radio while escaping, Teasle does allow Trautman to contact Rambo and try to persuade him to surrender peacefully. Rambo recognizes Trautman’s voice but refuses to give up, condemning Teasle and his deputies for their abuse and noting "They drew first blood" before hanging up. A National Guard detachment corners Rambo at the entrance of an abandoned mine. Against orders, they use a rocket, collapsing the entrance and seemingly killing Rambo. He survives, however, finds an alternative way out and hijacks a supply truck, which he uses to return to town. From the truck, he takes an M60 machine gun and ammunition. To distract his pursuers, he blows up a gas station, shoots out most of the town's power, and destroys a gun store near the police station. Teasle has positioned himself on the roof of the station to search for Rambo. When Rambo spots him there, the two engage in a brief gunfight, which ends with Teasle being shot and falling through a skylight. As Rambo prepares to kill him, Trautman arrives and warns Rambo that he will be shot if he doesn't surrender, urging him to consider, as the last survivor of his elite unit of Green Berets, that he wouldn't want to close that chapter in disgrace. Rambo collapses in tears and talks about the events that happened to him in Vietnam and after his return. Teasle gets transported to a hospital for medical treatment, while Rambo surrenders to Trautman and is taken into custody. Ted Kotcheff had been approached with the project in 1976. He only returned to work on First Blood after Mario Kassar and Andrew G. Vajna of Anabasis Investments offered to finance one of his projects. Kotcheff offered the role of John Rambo to Sylvester Stallone, and the actor accepted after reading the script through a weekend. When David Morrell wrote the novel, which was published in 1972, the producers first considered Steve McQueen but then rejected him because they considered him too old to play a Vietnam veteran from 1975. For the role of Sheriff Teasle, the producers approached Academy Award winners Gene Hackman and Robert Duvall but both turned the part down. Lee Marvin, another Oscar winner, turned down the part of Colonel Trautman. Kirk Douglas was eventually hired, but just before shooting began, Douglas quit the role of Colonel Trautman over a script dispute; Douglas wanted the film to end as the book did (Rambo and Teasle fatally wound each other, Trautman finishes Rambo with a kill shot then sits with the dying Teasle for the sheriff’s final moments). Rock Hudson was approached but was soon to undergo heart surgery and had to pass up the chance to work with Stallone. Richard Crenna was quickly hired as a replacement; the role of Trautman became the veteran character actor's most famous role, his performance of which received much critical praise. Various scripts adapted from Morrell's book had been pitched to studios in the years since its publication but it was only when Stallone decided to become involved with the project that it was finally brought into production. Stallone's star power after the success of the Rocky films enabled him to rewrite the script, to make the character of John Rambo more sympathetic. While Morrell's book has the Rambo character kill many of his pursuers, and Kozoll and Sackheim's draft had him killing sixteen people, in the movie Rambo does not directly cause the death of any police or national guardsmen. Stallone also decided to let Rambo survive the film instead of keeping the book's ending where he dies. A suicide scene was filmed but Kotcheff and Stallone opted to have Rambo turn himself in at Trautman's urging. Stallone did an estimated seven revisions of the script. Kotcheff requested further work be done on the script, which was performed by Larry Gross and David Giler. The film was shot in British Columbia, Canada in the winter. The town scenes in the movie were shot in Hope and the nearby Othello Tunnels, called Chapman Gorge in the film, while the rest of the movie was shot in Golden Ears Provincial Park and Pitt Lake in Pitt Meadows. The weaponry used in the film had to be imported into Canada. Over 50 of the imported firearms were stolen midway through the filming. The film's score was composed and conducted by Jerry Goldsmith, whose theme "It's a Long Road" added a new dimension to the character, and featured in the film's three sequels and animated spin-off. The soundtrack was originally released on LP by the Regency label, although it was edited out of sequence for a more satisfying listen. The album was reissued on CD with one extra track ("No Power") twice, first as one of Intrada Records' initial titles, then as an identical release by Varèse Sarabande. The complete score was released by Intrada in a 2-CD set, along with a remastered version of the original album (with the Carolco logo [previously released on La-La Land Records' Extreme Prejudice album] and the Rambo: First Blood Part II trailer music added), on November 23, 2010, as one of their MAF unlimited titles. First Blood topped the North American box office for three weeks in a row, and its $6,642,005 opening weekend was the best October opening at the time. The film ended as a significant financial success, with a total gross of $47 million domestically, ranking as the 13th highest-grossing film of the year, and $125 million worldwide, against a $14 million budget. First Blood originally received generally mixed reviews, with several critics noting that the plot lacks any sense of credibility. Variety called the film "a mess" and criticized its ending for not providing a proper resolution for the main character. More recently, Leonard Maltin gave the film one-and a half stars out of four, saying that it "throws all credibility to the winds about the time [Rambo] gets off with only a bad cut after jumping from a mountain into some jagged rocks". In 2008, First Blood was named the 253rd greatest film ever by Empire magazine on its 2008 list of The 500 Greatest Movies of All Time. Contemporary and retrospective reviews of the film have been positive, and it is considered by many as one of the best films of 1982. First Blood's release on DVD sparked a series of contemporary reviews, earning it an 88% "Certified Fresh" rating from Rotten Tomatoes and a score of 62 ("generally favorable") from Metacritic. First Blood has received the most positive reception of the Rambo series, while the next three sequels received mixed or average reviews; however, the sequels still developed strong cult followings. In a 2011 article for Blade Magazine, by Mike Carter, credit is given to Morrell and the Rambo franchise for revitalizing the cutlery industry in the 1980s; due to the presence of the Jimmy Lile and Gil Hibben knives used in the films. In 2003, Blade Magazine gave Morrell an industry achievement award for having helped to make it possible. Author Morrell recorded an audio commentary track for the First Blood Special Edition DVD released in 2002. Actor Stallone recorded an audio commentary track for the First Blood Ultimate Edition DVD released in 2004. This edition also includes a "never-before-seen" alternate ending in which Rambo commits suicide— a fate more in line with the original novel's ending— and a "humorous" ending tacked on afterwards. A brief snippet of the suicide ending appears in a flashback in the fourth movie. Lionsgate also released this version on Blu-ray. Both commentary tracks are on the Blu-ray release. Momentum Pictures released an HD DVD version of First Blood in the United Kingdom in April 2007. Lionsgate also released First Blood as a double feature on February 13, 2007, along with 2004's The Punisher. The film was re-released as part of a 6-disc box set, which contains all four films in the series, on May 27, 2008. However, the box set is missing the David Morrell commentary, even though the packaging clearly states it is included. In anticipation of the release, the film was shown back in theaters for one night, May 15, 2008, through Fathom Events; the alternate ending was shown after the main feature. First Blood was released on 4K UHD Blu-Ray on November 9 2018. In May 2013, Original Entertainment confirmed to have agreed to a five-picture deal with Millennium Films to produce Bollywood remakes of First Blood, The Expendables, 16 Blocks, 88 Minutes, and Brooklyn's Finest, with the productions for Rambo and The Expendables expected to start at the end of that year. In early 2016, Siddharth Anand was announced as the director and the film will be co-produced by Anand, Daljit DJ Parmar, Samir Gupta, Hunt Lowry, Saurabh Gupta and Gulzar Inder Chahal. The film will specifically remake First Blood and will follow the last member of an elite unit in the Indian Armed Forces returning home only to discover a different war waiting for him, forcing Rambo to the jungles and mountains of the Himalayas and unleash mayhem and destruction. In May 2017, Tiger Shroff was cast in the role of Rambo with principal photography set for February 2018 for a late 2018 release date. A sequel Rambo: First Blood Part II, was released in 1985. ^ a b "First Blood (1982)". AFI Catalog of Feature Films. Retrieved October 3, 2018. ^ "FIRST BLOOD (15)". British Board of Film Classification. November 10, 1982. Retrieved August 31, 2015. 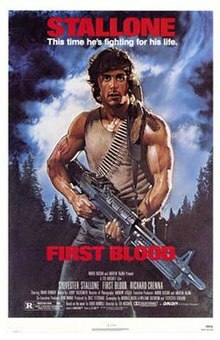 ^ a b "First Blood (1982) - Box Office Mojo". boxofficemojo.com. ^ Setoodeh, Ramin. "Sylvester Stallone Is Retiring From Playing Rambo". Variety. ^ a b c d e Drawing First Blood. First Blood DVD: Artisan. 2002. ^ "Steve Mcqueen Bio". Yuddy.com. Archived from the original on July 18, 2010. Retrieved July 18, 2010. ^ "Filming locations of First Blood in Hope, BC, Canada". Retrieved July 18, 2010. ^ "Movie Review - First Blood". The New York Times. October 22, 1982. ^ "Hope Celebrates 25th Anniversary of First Blood". British Columbia Film Commission. September 20, 2007. Archived from the original on April 12, 2013. ^ First Blood DVD Commentary by Sylvester Stallone. YouTube. July 19, 2014. ^ "News". The Ottawa Citizen. Ottawa, Ontario, Canada. March 12, 1982. ^ "First Blood (1982) - Weekend Box Office Results". Box Office Mojo. Retrieved May 21, 2010. ^ "1982 Yearly Box Office Results". Box Office Mojo. Retrieved May 21, 2010. ^ "Box Office Information for First Blood". The Numbers. Retrieved January 29, 2012. ^ a b "First Blood (1982): Reviews". Metacritic. Retrieved May 21, 2010. ^ "Review: First Blood". Variety. December 31, 1981. Retrieved June 25, 2013. ^ Maltin, Leonard (2009), p. 462. Leonard Maltin's 2010 Movie Guide. ISBN 978-0-452-29557-5. Signet Books. Accessed October 21, 2010. ^ "Empire's The 500 Greatest Movies of All Time". Empire Magazine. Retrieved May 21, 2010. ^ "The Greatest Films of 1982". AMC Filmsite.org. Retrieved May 21, 2010. ^ "The 10 Best Movies of 1982". Film.com. Archived from the original on June 18, 2010. Retrieved May 21, 2010. ^ "Best Films of 1982". listal.com. Retrieved July 15, 2010. ^ "Most Popular Feature Films Released in 1982". IMDb.com. Retrieved May 22, 2010. ^ "First Blood (1982): Reviews". Rotten Tomatoes. Retrieved May 21, 2010. ^ "First Blood Movie Review, Roger Ebert". Chicago Sun-Times. January 1, 1982. Retrieved July 18, 2010. ^ "BBC Film Reviews, First Blood". BBC. Retrieved July 18, 2010. ^ "First Blood: A movie review by James Berardinelli". ReelViews. Retrieved July 18, 2010. ^ "Rambo: First Blood Part II". Rotten Tomatoes. Retrieved April 21, 2014. ^ "Rambo III". Rotten Tomatoes. Retrieved April 21, 2014. ^ "Rambo (Rambo IV)". Rotten Tomatoes. Retrieved April 21, 2014. ^ Carter, Mike (2011). "Naked Edge". Blade. F&W Media. 39 (5): 126–130. ^ "Rambo (2008): DVD and BluRay Details". MoviesOnline.ca. Archived from the original on June 17, 2010. Retrieved July 18, 2010. ^ "First Blood - 4K Ultra HD Blu-ray Ultra HD Review | High Def Digest". ultrahd.highdefdigest.com. Retrieved November 11, 2018. ^ McNary, Dave (May 15, 2013). "Original Ent. Plans Bollywood Remakes of 'Rambo,' 'Expendables' (EXCLUSIVE)". Variety. Retrieved May 20, 2017. ^ Dhar, Debanjan (February 1, 2016). "Director Siddharth Anand To Remake Hollywood Movie 'Rambo' After Remaking 'Knight And Day'". Story Pick. Retrieved May 20, 2017. ^ a b c Brzeski, Patrick (May 18, 2017). "Cannes: Indian 'Rambo' Remake Finds Its Answer to Stallone (Exclusive)". Hollywood Reporter. Retrieved May 20, 2017. ^ Turner, Lauren (May 22, 2017). "Stallone backs Bollywood Rambo remake". Retrieved April 6, 2018 – via www.bbc.com.